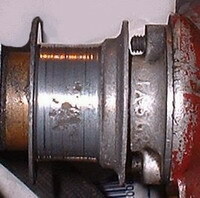 The fan pulley profile on my spare engine is not very good. 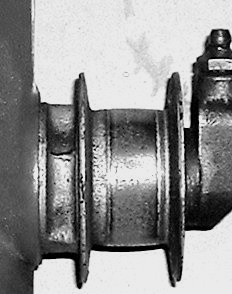 I believe the camshaft and fan pulley, which drives the cooling fan via a flat fan belt, was deliberately profiled. 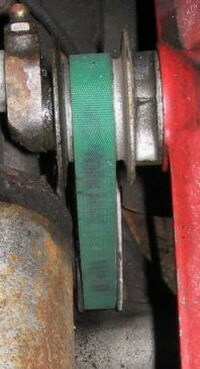 The idea is that when left slack, the belt automatically rides in the centre of the pulley, with no tendency to run off - the same sort of magic which keeps in place the long belts used by traction steam engines to drive remote equipment. A year or two ago at various rallies I surreptitiously examined the fan belt tension of some Austin Sevens daring to display their engines. Just one car had a slack belt ..mine! The trouble is we have always been told to ensure our fan belts are tight on our cars (modern, that’s anything post 1950!!) - to avoid overheating and flat batteries. But 'Sevens' don't drive a dynamo or a water pump via the fan belt, all we need is something to circulate the air when we are stationary or at low speed, normally the ram effect when we're moving is enough to keep our water off boiling point. It maybe the flanged edges give us the idea the belt may fly off if there’s no flanges, but in fact the belt at the right sort of tension, like the above mentioned traction engines, will ride in the centre of the pulley IF the profile is correct. You may wonder why else would Herbert Austin have designed the pulley with flanges? I believe it's a kind of belt and braces. 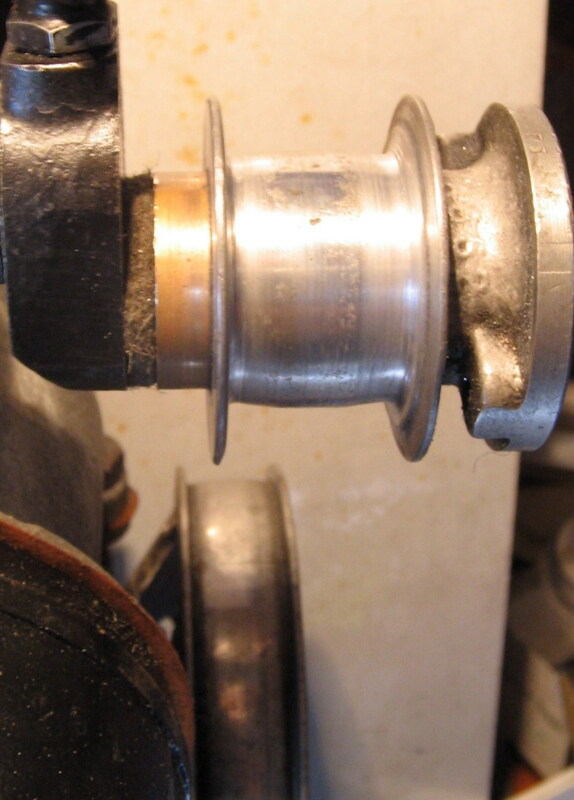 A tight fan belt leads to rapid wear of the fan-pulley bush and spindle: lubrication is only an infrequent squirt with a grease gun. There is no ball bearing nor thin-film lubrication system to withstand the sideways forces caused by a tight fan belt. The worn bearing then becomes the source of that characteristic 'Seven' tinkling sound, and yes I know the starting handle grip can rattle too. My experience shows a very floppy fan belt (1.5" of slack) works well. 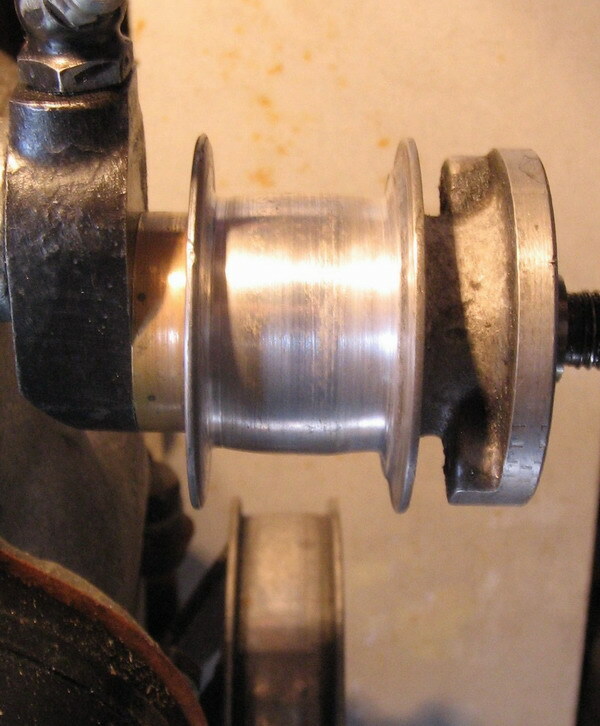 With a medium tight belt, the self-alignment fails, and the belt can run up onto the shallow pulley flanges. With a very tight belt, the belt stays in place but one is courting accelerated bush wear and as shown in one of these photos the profile can be completely worn away – this is the profile that started this article (again!). So two photos, the correct profile on my old, old car (CG), and the wrong one on the other Box Saloon (CV). I then came across another problem – Alignment. I thought if it’s the correct camshaft/fan pulley and the correct fan mounting bracket, all would be well, but when I came to complete some work on my spare engine I found that all was not well. The fabric bush to the back of the spindle is too thick – it’s been there a year or two, but it pushes the fan pulley forward so the belt cannot ride on the pulleys correctly, BUT, thinner fabric bushes are not available – so I'm told, I'm still looking though. Centre: Should look like this with thin bush. Right: As it should be. This article, written by Sandy Croall, originally appeared in CA7C Seven Focus April 2010 p21 and August 2010 pp 24-25.